How would you handle this case? Read the facts and see if the judge agrees YOU MAKE THE CALL 8 ©2019 Thomson Reuters Canada Ltd. All rights reserved. No part of this publication may be reproduced, stored in a retrieval system, or transmitted, in any form or by any means, electronic, mechani- cal, photocopying, recording or otherwise, without the prior written permission of the publisher. The publisher is not engaged in rendering legal, accounting or other professional advice. If legal advice or other expert assistance is required, the services of a competent professional should be sought. The analysis contained herein represents the opinion of the authors and should in no way be construed as being either official or unofficial policy of any governmental body. GST #897176350 Emplo y ment Law Today www.employmentlawtoday.com Published biweekly 22 times a year Subscription rate: $299 per year CUSTOMER SERVICE Tel: (416) 609-3800 (Toronto) (800) 387-5164 (outside Toronto) E-mail: customersupport.legaltaxcanada@tr.com www.employmentlawtoday.com Thomson Reuters Canada Ltd. One Corporate Plaza 2075 Kennedy Road, Toronto, Ontario, Canada M1T 3V4 Director, Media Solutions, Canada: Karen Lorimer Publisher/Editor in Chief: Todd Humber Editor: Jeffrey R. Smith E-mail: Jeffrey.R.Smith@tr.com Sales Manager: Paul Burton Email: paul.burton@tr.com Phone: (416) 649-9928 Marketing Co-ordinator: Keith Fulford Email: keith.fulford@tr.com Phone: (416) 649-9585 Emplo y ment Law Today Canad ad ad ad ad ad a ian an an www.employmentlawtoday.com YOU MAKE THE CALL Was Rouse wrongfully dismissed? OR Was there just cause for dismissal? IF YOU SAID Rouse was wrongfully dismissed, you're right. e court found both Rouse and the Drakes exaggerated their sides of the story — it was likely Rouse wasn't "the terrible employee, essentially a useless, insubordinate fraud- ster" the Drakes made her out to be and the Drakes weren't "the racist psychopaths" that Rouse portrayed them as. e court de- termined there were some problems with Rouse — she interfered with the security cameras because they made her uncomfort- able, she was sometimes late as there was no written schedule, she referred patients to the other dentist on a few occasions — but there was no evidence she intentionally falsifi ed her work hours or was guilty of any other dishonest misconduct. e court found none of the issues with Rouse were worthy of dismissal, especially since she hadn't received any formal disci- pline. e Drakes were ordered to pay her the equivalent of eight months' compen- sation as reasonable notice for her seven- and-one-half years of service. e court declined to award aggravated or punitive damages, fi nding that the Drakes believed they had just cause for dismissal and, while they were not "people persons," there was no evidence they were "unduly sensitive" or caused Rouse psychological distress in her dismissal. For more information see: • Rouse v. Drake & Drake et al., 2018 Car- swellOnt 2161 (Ont. S.C.J.). 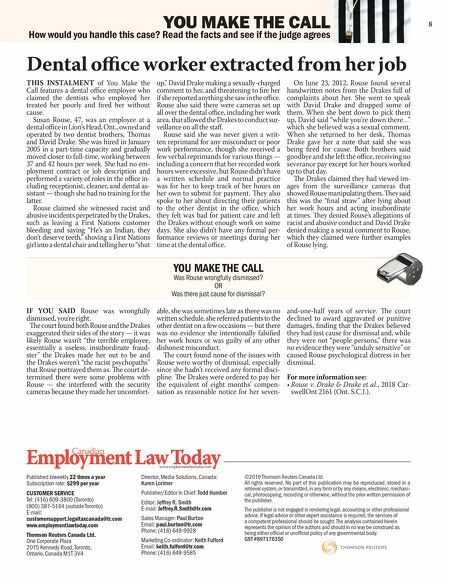 Dental offi ce worker extracted from her job THIS INSTALMENT of You Make the Call features a dental offi ce employee who claimed the dentists who employed her treated her poorly and fi red her without cause. Susan Rouse, 47, was an employee at a dental offi ce in Lion's Head, Ont., owned and operated by two dentist brothers, omas and David Drake. She was hired in January 2005 in a part-time capacity and gradually moved closer to full-time, working between 37 and 42 hours per week. She had no em- ployment contract or job description and performed a variety of roles in the offi ce in- cluding receptionist, cleaner, and dental as- sistant — though she had no training for the latter. Rouse claimed she witnessed racist and abusive incidents perpetrated by the Drakes, such as leaving a First Nations customer bleeding and saying "He's an Indian, they don't deserve teeth," shoving a First Nations girl into a dental chair and telling her to "shut up," David Drake making a sexually-charged comment to her, and threatening to fi re her if she reported anything she saw in the offi ce. Rouse also said there were cameras set up all over the dental offi ce, including her work area, that allowed the Drakes to conduct sur- veillance on all the staff . Rouse said she was never given a writ- ten reprimand for any misconduct or poor work performance, though she received a few verbal reprimands for various things — including a concern that her recorded work hours were excessive, but Rouse didn't have a written schedule and normal practice was for her to keep track of her hours on her own to submit for payment. ey also spoke to her about directing their patients to the other dentist in the offi ce, which they felt was bad for patient care and left the Drakes without enough work on some days. She also didn't have any formal per- formance reviews or meetings during her time at the dental offi ce. On June 23, 2012, Rouse found several handwritten notes from the Drakes full of complaints about her. She went to speak with David Drake and dropped some of them. When she bent down to pick them up, David said "while you're down there…" which she believed was a sexual comment. When she returned to her desk, omas Drake gave her a note that said she was being fi red for cause. Both brothers said goodbye and she left the offi ce, receiving no severance pay except for her hours worked up to that day. e Drakes claimed they had viewed im- ages from the surveillance cameras that showed Rouse manipulating them. ey said this was the "fi nal straw" after lying about her work hours and acting insubordinate at times. ey denied Rouse's allegations of racist and abusive conduct and David Drake denied making a sexual comment to Rouse, which they claimed were further examples of Rouse lying.